If regular art bores you and you want the next best thing or just something a bit peculiar, you’ve ended up in the right place. With South of Sane, you will find yourself standing in front of their artworks, listening to the sounds of every piece telling its story, expressing pain, happiness and feelings you did not know existed. South of Sane is a local movement by a group of artists, musicians, designers, engineers and architects, who came together to revive the cultural scene in Kuwait. South of Sane has faith in all its members, whether they are engineers or drivers, rich or poor, Kuwaitis or non-Kuwaitis. They do not reveal their real names or faces because they want the world to only know their art – fame is not their goal. Kuwait Times was the first media outlet to visit South of Sane’s studio. It is more like a wonderland where nothing makes sense. Strange artworks and powerful original paintings touch your soul, and creative songs, opera and jazz music go with the mood. It’s very interesting how much the imagination and creativity of some people has evolved to create beautiful new art forms. Some of them may be a little strange, but they appreciate what they’ve achieved. “When I was 14 years old, my father asked me to learn to play an instrument, and when I refused, he said, ‘A man without passion can never be called a man.’ That sentence stuck with me forever,” said “Dali”, the founder of South of Sane. And that is when he started to follow his passion. Dali told Kuwait Times that when he started out, he wanted to be an artist, but not a commercial one. “I read a line once that said ‘ars est celare artem’. It means ‘it is art to conceal art’, that is, true art conceals the means by which it is achieved. This means that in the best works of art, the audience is not distracted by the artist’s technique, but responds instead to the power of the work (as the artist intended),” he said. Dali, 35, works as a pilot and is an antique collector too. “Because of my job, I travel around the world. Ten years ago I went to Indonesia, and when I walked into a mall, I found art pieces that you won’t find in a museum, at a really cheap price. I could not understand why those artists were not known along with their original pieces. When I asked myself this question, I realized there is a big difference between a painter and an artist. To be a painter is to know how to draw, but to be an artist, you need a vision and make people believe in your vision and imagination,” he said. People in Kuwait who are known as artists are copycats, claimed Dali, adding South of Sane is trying to educate people. “South of Sane is trying to explain what we have been taught in schools and universities about the history of art. You can get inspired or come up with a technique but you can never copy just to be famous and get ‘likes’ on Instgram, or just to make people call you an artist so you can be cool,” he said. When Dali started gathering his team, a friend with a passion for art joined him, and they named their team “South of Sane”, because people used to tell them that they are insane and what they were doing is not art, since art is beautiful, butterflies and blue skies. Regardless of how open-minded people are, they experience a subtle bias against creative ideas when faced with uncertain situations. Dali claims to be an expert on defining what art is and what it is not. Every artist has his or her own unique taste and ways of expression, and Dali wants people to not define art in a limited manner. “A generation without culture and art is a violent one; this is evident in how we as a nation have become – more reliant on how our image is perceived on social networks rather be respected for what we stand for. Kuwait has always been and always will be the land of creation and innovation and a haven in the region for fine arts and humanities. I propose we put an end to ‘recycled’ art and let the underground come out and show the world that we are not all driven by materialism and trends; that this country has its roots deeply founded in culture and arts; that we as a nation are free in soul and mind. Rejection is how every great inventor starts,” asserted Dali. “Masha”, a member of South of Sane, brought Dali’s works to the limelight. Masha runs an online blog on art and culture. She started blogging about art in Nov 2011, then launched her first blog, Al-Maha Art, which morphed into an online magazine. In 2013, Dali invited Masha to South of Sane’s studio, and Masha described what she saw as most unique and exotic art. 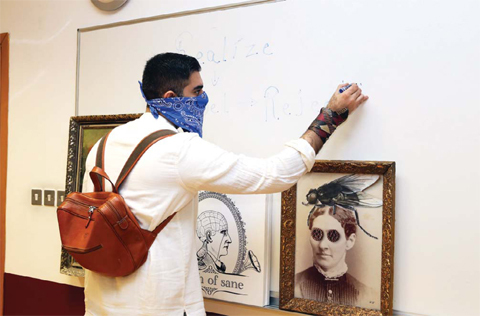 They kept meeting back and forth, talking about art in Kuwait and exhibitions, and 2015 saw Dali’s latest artworks, one of them an installation, displayed at Nuqat in November. “I told him I know you don’t want to be considered as an artist, but I want to create a show for you. I said it is time for this to be shared with the public. A month later, Nuqat announced their concept of their 2015 exhibition called ‘Copy/Paste Syndrome’, and what a coincidence that one of Dali’s artworks is called ‘Anti-art’. This piece talks about being against the usual, commercialism, mainstream, and tells you not to copy or steal someone’s work and give the credit to yourself – someone is going to find about it,” Masha said. Masha told Kuwait Times that 40 years ago, Kuwait was an oasis of creativity. Everybody used to come to Kuwait, because back then, Kuwait was a welcoming land for talents. The best paintings, music, books and novels were produced in Kuwait for Kuwaitis and non-Kuwaitis. Even the father of pop art came to Kuwait in 1970s. “It was the first Gulf country he ever visited because we had opened the first commercial art gallery, the Sultan Gallery, and it still open. Sabah and Um Kalthom sang in Kuwait too,” she reminisced. Masha expressed sadness to see young Kuwaitis care more about fashionistas on Instagram rather than knowing real artists. “This is one of the bad sides of globalization – everywhere in the world, people stopped caring for what really matters and shifted their attention to other things that can give them quick fame,” she lamented.